A year ago Monday, en route to its fourth straight America East Championship, Stony Brook Women’s Lacrosse needed two goals in the last 90 seconds to overcome Albany and win 9-8. On Sunday, on the way to its fifth straight America East championship loss, the Great Danes needed two goals in the last 90 seconds to complete a seven-goal comeback. They could not take advantage of the karmic irony and fell short, 14-12. Unfortunately, for Battaglino, the Brooklyn Dodgers lost only four World Series to the New York Yankees over its notorious six-year stretch of futility from 1947-53. This year’s America East Championship loss is Albany’s fifth in a row. The win was Stony Brook’s 26th straight in America East play and thirteenth straight overall. The effort, led by junior attacker Kylie Ohlmiller’s six goals, improved the Seawolves’ overall record to 18-1 heading into the NCAA playoffs. Ohlmiller netted her first goal in the first 40 seconds. She quickly added two more in the next five minutes. Albany senior attacker Dakotah Savitcheff matched Ohlmiller’s hat trick in the first half. Even so, the game went into halftime with Stony Brook leading 7-4. Ohlmiller, who was named the America East tournament’s Most Outstanding Player after the game, finished the day with eight assists and three points shy of the all-time Division I records in those categories. The Tewaaraton Award is awarded annually to each year’s most outstanding college lacrosse player. The path to the America East Championship and a run in the NCAA tournament was forged by Ohlmiller’s historic season after senior attacker Courtney Murphy — who had 100 goals in 2016 — went down with a season-ending ACL tear in February. One of those recurring sources, senior attacker Sam Jaffe, was working overtime late in the second half. She rallied the crowd, nearly leaping into the stands as Stony Brook’s seven-goal lead slowly dwindled. The Seawolves were up 13-6 with 13 minutes to go in the game. Stony Brook midfielders, lead by sophomore Keri McCarthy and senior Dorrien Van Dyke, dominated the draw controls for Stony Brook, out-drawing Albany midfielders 17-3. However, Albany won five of the next seven draw controls, pulling within two goals with 96 seconds to go in regulation. 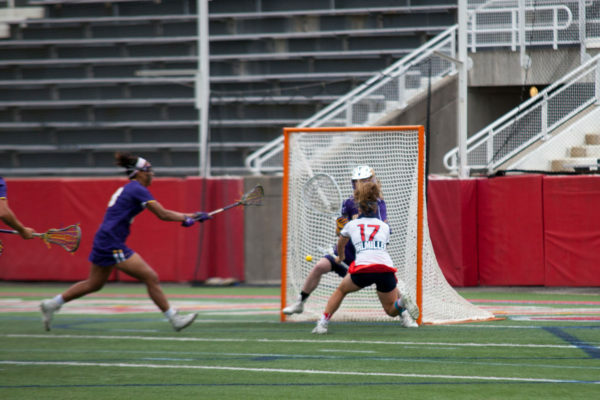 Albany won the next draw control, but, before they could convert, Stony Brook junior defender Carolyn Carrera knocked the ball out of the cradle of Albany senior attacker Kenzie Neal. Stony Brook sophomore goalkeeper Anna Tesoriero picked it up and passed it downfield. “I have so much faith in Anna [Tesoriero] and Brooke [Gubitosi] and all those girls down there,” Ohlmiller said of the defense. Ohlmiller, Van Dyke, and Spallina all cited senior defender Ashley Gomes for stepping up and taking over for the injured senior defender Jessica Volpe. Much of the rest of the offense came from Ohlmiller’s younger sister, freshman attacker Taryn Ohlmiller, who had three goals. Van Dyke and freshman midfielder Ally Kennedy added two goals apiece, while senior midfielder Kristin Yevoli had one. Next up: the NCAA tournament, where the Seawolves will be the No. 8 overall seed. The Seawolves will host Bryant University on Friday night at Kenneth P. LaValle Stadium. The game will begin at 4:30 p.m..